Originally a farmhouse, the building became an inn when the farmer’s wife began brewing and selling ale in 1760. A list of landlords dating back to this time is displayed in the bar. The cosy shoehorn bar features oak beams, a unique collection of shoehorns, horse brasses and pictures and articles relating to the history of the inn. During colder months, the bar is kept snug by a real coal fire. Off the bar is the ‘Settle Down’, originally the farmhouse parlour, with exposed stonework and oak beams. This room is ideal for families, equipped with a number of games and toys for young children. Another room accessible from the bar is the wood panelled Tap Room, used by locals who come in for a drink and chat. This room has a darts board (we have a very good darts team). 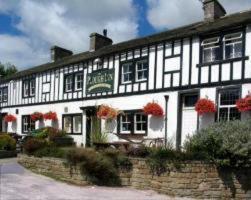 The inn has 2 restaurants, the Harlequins Conservatory Restaurant and the Oak Room. Harlequins Restaurant looks out over the garden and has magnificent views of the Yorkshire Dales with 2 of the famous 3 peaks clearly visible. This restaurant features the original farm well and a collection of clown dolls, figures and pictures. Come evening, candlelight reflects off the conservatory windows creating a romantic setting. The Oak Room is an old world restaurant with leaded light windows, oak panelling, old photographs of the inn and lots of bric-a-brac collected by owners over the years. The inn has a large car park to the side and front. For fine days there are plenty of tables at the front and in the garden. The village stocks can also be found here. Our menus are a mix of traditional and modern English dishes. The extensive bar menu includes dishes such as steak, kidney and black sheep ale pie, Lancashire hotpot, Whitby scampi and sirloin steaks. Our limited edition menu features dishes prepared from lamb, pork and beef supplied from farms within 3 miles of the inn. Our gourmet sausage menu includes the unique Wigglesworth Knot and the tasty Ribblesdale Ring. Our dessert menu features delicious locally made ice creams and cheeses from around the Yorkshire Dales. The breakfast menu has received the approval of the Delicious Yorkshire Breakfast Scheme which guarantees that the majority of the items on the menu have been sourced from local Yorkshire producers. We have an impressive selection of different types of gin from around the UK and an extensive wine list featuring wines from around the world. Price details:Rooms from £96.00 per night (includes discount for booking online).